Acupuncturists without Borders (AWB) teaches an approved continuing education course on "How to do Acupuncture in the Field for Traumatic Events" to help Acupuncturists interested in disaster relief in their local community and the larger global community how to work together and work with other relief agencies to help people affected by disasters and other traumatic events (see related posts on the Military Stress Recovery Project Clinics). They reinforce the use of the simple NADA (National Acupuncture Detox Association) protocol in recovery from traumatic events. NADA, as a protocol, is well-supported by research studies over a few decades. This protocol involves the use of 5 points in each ear (called auricular acupuncture) that help the body move from a state of "fight and flight" (sympathetic nervous system overload: anxiety, running thoughts, insomnia, shock) to "rest and digest" (parasympathetic nervous system response) mode. Reminding the body how to properly regulate its autonomic nervous system (in this case through acupuncture) helps a person be more resilient and better able to deal with their trauma. This (disaster relief acupuncture) is a useful tool for those immediately affected by a disaster or trauma and those who respond to the disaster itself (firefighters, ER providers, first responders, National Guard, military). Recently, local Licensed Acupuncturists trained in Disaster Relief Acupuncture through Acupuncturists without Borders have teamed up with some Medical Reserve Corps units. This is exciting news and should help make those who have a passion to help when disaster or trauma strike their community to be able to respond faster and more effectively. Click here for the letter from the Medical Reserve Corps. The Medical Reserve Corps (MRC) is a national volunteer organization (in the U.S.) for medical professionals ready to respond in times of disaster and whom are also interested in advocating public health and wellness. "The Santa Barbara County (California) Medical reserve Corps has expanded . . . on the diversity of medical professionals in their ranks. Since February of 2010, a unique group was formed within our MRC unit utilizing local medical professionals you might not typically think of in a disaster scenario, Acupuncturists! Currently, our acupuncture group consists of sixteen individuals. All of them, like all of our medical and non-medical volunteers, adhere to our corps requirements of: CPR/AED/First Aid as well as ICS 100 and 700 trainings, all are sworn Disaster Service Workers and have successfully completed a DOJ and FBI livescan report. How are these acupuncturists [used in] a disaster scenario? The best way to answer that question might be to describe their value in an actual deployment situation--the Santa Barbara 'Tea Fire' of 2008. While the Fire Fighters and other first responders labored endlessly, fighting the wildfires and rescuing citizens shift after shift, their stress level and fatigue took a mounting tool on them. Even when not on the fire line, their down time was filled with anxiety as well as mental and physical exhaustion. Enter the acupuncture team. 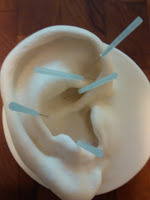 Through a method known as NADA protocol, small 'ear needles' were placed in the patients' ear. As reflexology isolates areas of the foot that related to other areas of the body, so too does the ear. The acupuncture needles are placed in corresponding ear locations that will relieve the stress, anxiety and other ailments of the first responders. They were able to rest and relax more thoroughly, enabling them to work more effectively once they returned to the fire line. The results were amazing and the treatment was appreciated and very well received! Our acupuncture group has become some of the more zealous members of our MRC. They are not only well organized and active, but constant proponents of healthy lifestyles through [complementary] medicine. I would highly recommend the formation of an acupuncture group in any Medical Reserve Corps nationwide. I wholeheartedly support the spirit as well as the outstanding work of this fine group of medical professionals. Santa Barbara County Medical Reserve Corps"
I highly recommend receiving at least the Level 1 training with AWB, How to do Acupuncture in the Field for Traumatic Events. While the acupuncture technique is simple and you probably already know it by rote, the networking and paperwork resources available through the training and continued connection to the larger organization are invaluable in this kind of work. If you are interested in connecting with your local Medical Reserve Corps, check out their website and click on your state for contact information. Peace to you in your work! !